Owned and neglected by the City for decades, it is nearly impossible to tell that the four structures were once upscale townhouses. 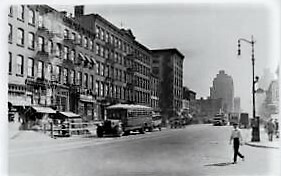 The east side of the Seventh Avenue block between 21st and 22nd Streets was lined with two- and three-story brick homes and shops in the years before the Civil War. The family of John Brown lived at No. 201 in 1858 with his wife, Catherine and their 2-year-old daughter Sarah. When the little girl showed symptoms of scarlet fever in January that year, Dr. H D. Ranney wrote a prescription. But tragically, he accidentally left behind a different prescription for laudenum--a drug which contained opium--which he had written for an elderly patient. It was a fatal blunder, resulting in little Sarah's death. Next door, at No. 203, Mrs. Levenstyn ran an interesting business in 1862. She purchased second hand clothing and household goods "for the California market." Following the war the four vintage buildings at Nos. 201 through 207 Seventh Avenue would make way for much grander residences. The Italianate-style houses were completed in 1868. Four stories tall above English basements, their elliptical arched openings wore molded lintels. The individual, but identical, cornices were upheld by hefty brackets. New York rowhouses at the time were routinely clad in brownstone, prompting Edith Wharton to complain that the city was "cursed with its universal chocolate-colored coating of the most hideous stone ever quarried." That could not be said of the new Seventh Avenue homes. The architect faced them in "Ohio stone," a light tan material that set them apart. On March 28, 1868 the Real Estate Record & Builders' Guide listed the construction cost of recent "first-class dwellings." Included was No. 207, on the corner of 22nd Street. Its cost was estimated at $3,500; or about $62,500 today. It is possible that No. 207 always had a shop in the lower level. The Italianate-style entrance to the rear, at No. 170 West 22nd Street, is too grand to have been merely a service entrance. That shop was home to the Hohorst grocery store by the mid-1890's. Hohorst sold the business to H. W. Martens in December 1899. It was apparently a thriving business, for Martens paid $2,000, a significant sum. Each of the entrances was identical to the now-painted example on West 22nd Street. In the meantime, the upper floors had been operated as a boarding house for several years; apparently one suite of rooms per floor. In 1892 William L. Linsey boarded here. He was described by The Sun as "a tall, ruddy-faced Englishman, who told his landlady that he speculated in Wall street for a living." But Linsey fell on hard times that spring. Struggling to stay afloat he pawned his watch and most of his clothing. He failed to pay his board the second week of May, and then the next. When he failed to come down to dinner on May 26, someone went to call him. He was found dead in his bedroom. The Sun ran the rather unfeeling headline "Suicide of a Shorn Lamb" and reported that Linsey had "swallowed poison and turned on the gas." The article noted "He hadn't a cent of money left." God bless you always, every, every minute. I must seek rest in the slumbers of the beyond. Eternity will be incomplete without you, dearest John. I have craved Divine forgiveness. I am too weak for this earth. Welcome sweet, sweet death. Another of the landlady's boarders seems to have made a quick exit two years later. An advertisement in The Evening World on April 19, 1894 succinctly announced "entire contents of 2d flat, 170 West 22d st., to be sold at once." On the opposite end of the row, No. 201 was home to musician Putman Cramer in 1870. As was the case with most well-heeled citizens, he may have been away from the city that summer. His advertisement in September announced "Dr. Putman Cramer, 201 Seventh Avenue, between Twenty-first and Twenty-second streets, begs to inform his pupils and the public in general that he is ready to resume his Vocal and Piano instructions." Like No. 207, the house was soon operated as a boarding house, run by Samuel Clark by 1873. Like most high-end boarding house proprietors, the Clarks took in only a few boarders who enjoyed several rooms, often an entire floor. Long term tenants were the family of Civil War veteran Captain Charles J. McGowan, here at least by 1873. That year daughter Janette taught in the boys' department of Public School No. 26 on West 30th Street. In 1869 the History and Honorary Roll of the Twelfth Regiment, Infantry, called McGowan, "one of the most active and intelligent officers in the National Guard." He had joined the regiment in 1861. In 1878 McGowan was brevetted to the rank of major. The family remained in the Seventh Avenue house at least through 1880. Clark and his wife had three young adult daughters. In September 1878 they took in a new boarder, Victor Davis Carlton Butler. The 43-year-old had lived next door for three years. "He was, therefore, well known in the neighborhood, not only for his agreeable manners, but for his weakness, which was drink," said the Minnesota newspaper the New Ulm Weekly Review. Butler came from an "excellent Georgia family." He worked as a bookkeeper for a paper merchant, Joseph Hayward, and "was understood to be in the receipt of a fair income outside of the salary allowed him by Mr. Hayward," according to The Newcastle Morning Herald. But Butler wore out his welcome when he "formed an attachment" with Clark's eldest daughter. The 23-year old Louise was described in newspapers as "an exceedingly prepossessing blonde." Her father "not desiring the alliance, had requested him to move," according to The Sun. Clark's wariness was well-founded. Butler's drinking problem had prompted his wife to divorce him in 1866, taking their five children with her. Clark had given him the deadline of November 26 to leave the house. It only made his drinking worse. New Ulm Weekly Review explained "Butler seemed to consider his suit hopeless, and he drank. His conduct caused an altercation with his employer...and he quit the store on Monday. Since then he had been at home most of the time, and under the influence of liquor. It is believed that he was crazy from the effect of liquor. He brooded over all his troubles." On the afternoon of November 26, the day he was to move out, Butler declared "he would never quit Mr. Clark's house, but would be taken from it a corpse," as reported in The Sun. The family did not take him seriously and "made light of it to him." In fact, he was quit serious. At around 5:00 that afternoon Mrs. Clark and her three daughters went to his room. He told them he had taken poison, threatened to throw himself from the window, and then took his single-barreled Colt pistol from the bureau drawer and put it in his pocket. All the women except for Minnie Clark left the room. She asked him "What are you going to do with that?" and he replied "Oh, nothing. But it is a handy weapon to settle matters with, is it not?" Then, before the young woman could react, he pulled out the firearm and uttering "God forgive me," fired a bullet into his brain. The Newcastle Morning Herald called him a "victim of love and melancholy." As the end of the century approached the Seventh Avenue neighborhood was drastically changing. A block to the east Sixth Avenue was lined with retail emporiums and the elevated railroad ran up its center. All of the basement levels of the row had been converted for business. In 1891 W. Ulmer renovated the basement of No. 201 for his saloon. The shop next door at No. 203 had been a furniture store at least since 1874. Under various proprietors, it would remain so at least through 1904. The lower level of No. 205 was converted for business around 1889. Mary A. Fitzgerald ran her ladies' tailoring establishment here that year. In 1897 it was converted to a restaurant, first run by H. Elias and then by J. A. Westervelt beginning in 1899. The Martens grocery store was still in the corner building after the turn of the century; but that would change in 1904 when the Excelsior Brewing Co. converted it to a saloon. It was later run by Peter and Michael McEntee by 1912 and they would operate it for several years. As the avenue changed, so did the former homes. Architect Hugh E. O'Reilly owned No. 205 in the first years of the 20th century and ran his office from the building. He was here at least through 1913. Samuel Coleman's pharmacy was in No. 205 by 1912 while Max Green's real estate office occupied the former parlor floor. In the Depression years there was one apartment per floor above the storefront of No. 203. A Chinese laundry occupied the store of No. 201 and the Marathon Restaurant was in No. 205. By the third quarter of the 20th century the four structures were beleaguered. In 1976 the City seized all four buildings through tax closure. The structures were entered into the Tenant Interim Lease Program, a program that allows tenants to manage and potentially buy the properties after major rehabilitation. But that never happened. The storefronts limped along. In the early 1980's vintage record store Pyramid Records was at No. 201 and My Old Lady, a "nostalgic clothes" store, was in No. 207. But upstairs things were going badly. Tenants were removed from Nos. 203 and 207 when the conditions were "deemed hazardous to poor structural integrity." The 1868 cornices were removed, leaving gray scars. While the City promised rehabilitation, nothing happened. In 2012 City Council Speaker Christine Quinn pushed hard for renovation. She told the New York Post "It's an eyesore, and it's a waste, and we only wish we'd be able to move it along faster." Kate Briquelet, writing in the New York Post on November 25, 2012 wrote "A cluster of four city-owned Seventh Avenue properties that should be renting for millions--and paying their fair share of taxes--sits nearly empty, boarded up and falling apart." Only two families remained in the apartments--one in No. 201 and the other in 205. In May 2018 the Department of Housing Preservation and Department announced intentions of redeveloping the properties. The proposal described "3 bedroom units to be included in the building program." But a few months later Joe Restuccia, co-chair of the Community Board 4 (CB4) Housing, Health & Human Services committee announced a change in plans. He told The Villager's Winnie McCroy that "somewhere along the line, the city discovered that various structural problems prevented the original facade of the building from being preserved, as CB4 would have liked. So they settled on demolition and new construction in a style that 'connects to the neighborhood around it.'" The 151-year old structures now await demolition to be replaced by a nine-story building of two- and three-bedroom affordable housing units. Reminds me of the collection of eyesores by Grand Central (692-696 3rd Avenue) and Midtown East (948-952 1st Avenue). Any idea what the stories are behind them, Daytonian? All are essentially from the same period. The First Avenue row doesn't look all that bad to me. The Third Avenue buildings, different story.